It’s in the papers on an almost daily basis, yet another house or business broken into, resulting in extensive damage. It’s no longer the infrequent break in by a drug addict, selling stolen electronics for pennies on the dollar to buy a fix. Or a burglar, taking more valuable property that can be sold to ‘the right connections.’ It’s an unfortunate reflection of our times (caused in part by a lack of work and high scrap metal prices), that more people are willing to commit burglary to tear out copper plumbing and other metals. 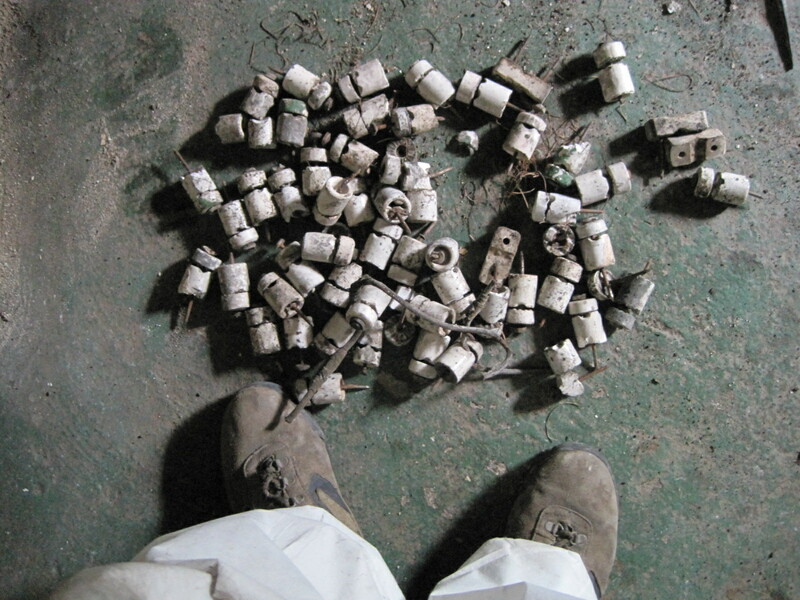 Sadly, one may get $200 for stolen scrap, but cause thousands of dollars in damage. And to think, I have a whole house full of metal, which needs to be torn out and scrapped. 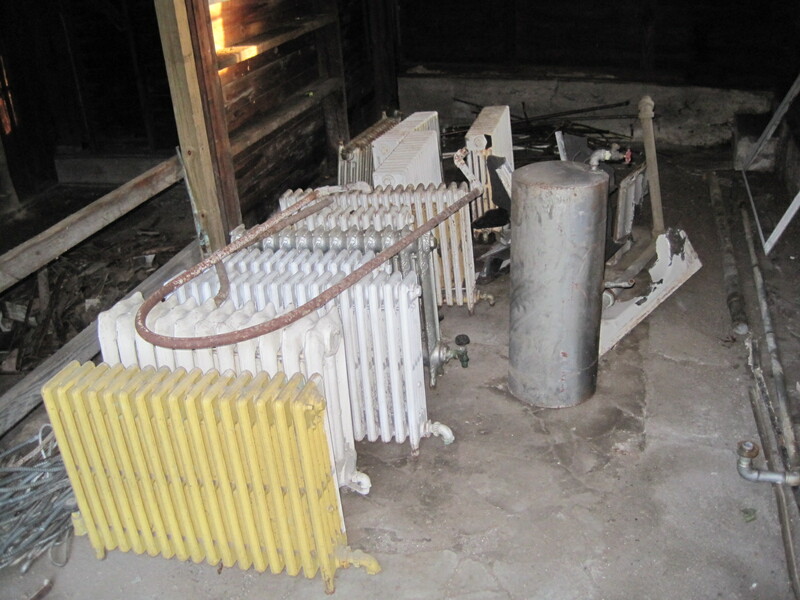 As a matter of fact, the house has all sorts of scrap metal, including old electrical wiring, obsolete iron gas pipes, split copper plumbing, cracked cast iron radiators, sheet metal around the furnace, and so much more. Oddly, the scrap metal is the most valuable thing in the house, and the only reason I lock the door. I am curious how much money I will actually get for the all the scrap metal. Whatever I get (to be put toward the renovation) will be appreciated, drop in the bucket though it may be. The cast iron radiators weigh sixty to a hundred pounds each, and there are ten of them The cast iron tub must have weighed a couple of hundred pounds, which has now, thanks to Evan and the sledgehammer, been reduced to manageable pieces. There is also the odd steel tank that was bolted to the basement ceiling (shown in the photo above, standing on end), the purpose of which is still a mystery to me. All of the various metals are getting cut out, separated, and neatly stacked. 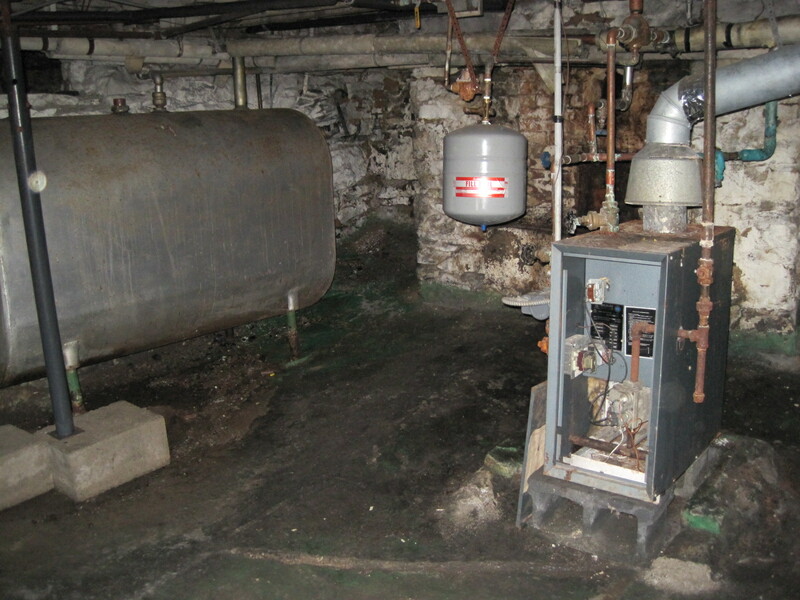 There was an old oil tank in the basement too, which seemed to have some oil in it as well. I can only imagine the oil was quite old since the last form of heat in the house was a natural gas furnace. The tank was quite large and very heavy. I couldn’t imagine its value in scrap being more than $50, and I would also have to do something with the oil. So I put an ad in craigslist.com, offering it free to anyone who would haul away the tank, and the oil. Sure enough, craigslist came through and there was great interest. Funnily enough, I happened to share a mutual friend with the first person to contact me. We didn’t know this when he came to look at the oil tank though, and we both did not remember that we had actually met before (I guess we are both bad with names, and faces). After looking at the tank, he wanted it. However, we had to coordinate our schedules, for a time that I would be able to let him in, and his son would also be available to help. This scheduling was quite difficult, and I ended up having to miss a party for a friend’s son celebrating his first birthday. As we strained and grunted hauling the tank out of the house, he mentioned that he would rather be drinking a beer poolside at a birthday party for his friend’s son. It clicked. Too funny. I had to agree. Small world. Dayton was grateful for the tank and oil, and I was very grateful to be rid of it. 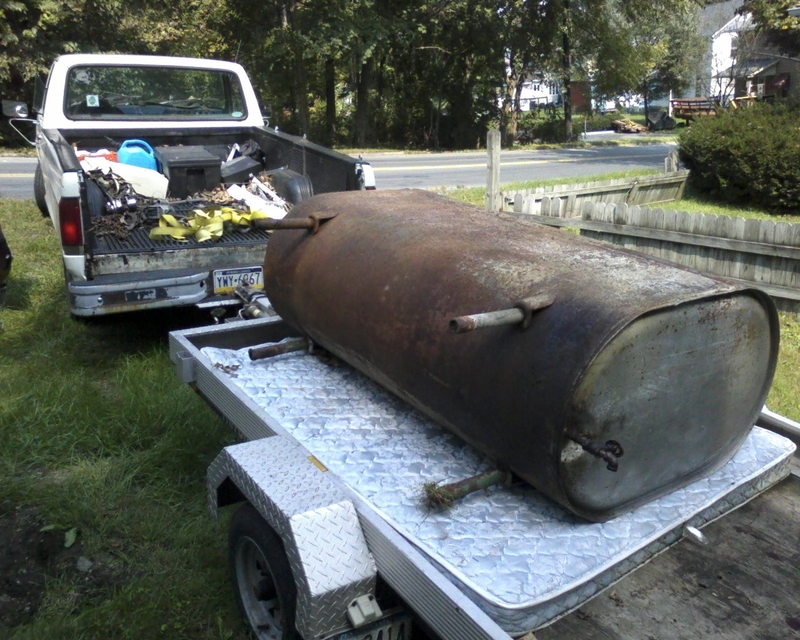 As it happened, the oil tank, even drained of the oil, was even heavier than I thought. Fortunately, he had the right equipment – a strong son (and a rolling car jack, iron pipes, and a strong back). 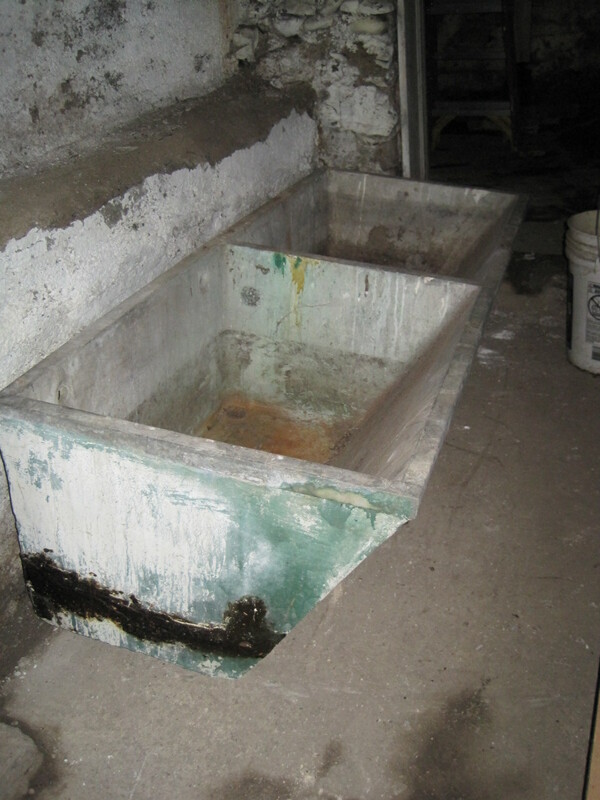 Since I helped him remove the oil tank, I asked if he and his son would help me remove what I believe to be a double soapstone sink from the basement. For those that don’t know, double soapstone sinks weigh more than a not so small elephant, and believe it or not, are about as awkward. Despite the rolling jack and iron pipes, his son, and his strong back (and my herculean contribution, of course), the sink really didn’t move very far at all. Luring it with peanuts would have had the same result. The weight of that thing is actually quite remarkable. Do you know anyone who may be interested in a well used 400+ pound double maybe soapstone sink? Back to trusty craigslist.com. It will be interesting to see who I (re-)meet this time. The copper was the bonanza when we stripped a house, although I sort of prefered them to the plastic stuff we have there now. Your pictures remind me of where we were 6-8 months or so ago. We had a massive dumpster too. We had that scrap metal to offload. Thanks for the support. I hope that in 6 – 8 months I have a house full of pex plastic plumbing (although I too have a nostalgia for copper, but not installing it! ).